I am getting ready to taste Felino Mezcal for the first time, and I am getting more curious about it. I expect it to be more like tequila than traditional mezcal due to 3 factors—the blue agave used, the use of modern autoclaves and the lack of agave fibers in the fermentation process. What I am really looking forward to is finding the flavor of the land that the agave comes from, also known as "terroir". I know with this tasting that my palate will be experiencing something new from the state of Zacatecas. Using a Riedel I swirl the straw-colored nectar to reveal its slow thin legs and a texture that seems a bit thin as well. Holding the glass about 16 inches away from me I am able to notice a scent that is rather new and this makes the anticipation of tasting this mezcal even greater. Wow! The nose is wild…something new that seems slightly chemically—but not in a bad way…then it opens up into "green" herbal mist with almost no alcohol that is noticeable. The second smell reveals layers of earth—black pepper, spice and dust with herbs and citrus on top. The layers in the nose are really nice—I look forward to tasting an unaged version of Felino. While I know the oak has mellowed this mezcal, it has not overtaken it. As I let the first taste sit on my lips it is very mellow like water then it starts to do a tingly "Happy Dance." A small bit dripped onto my tongue and shined like a beam of sunshine on this dark, rainy, cloudy day. With my first sip the taste delivered what my nose had noticed in spades—tons of dry earth with a long finish. This is in no way tequila and for sure the most "mellow" mezcal I have ever had. While I swirl the thinly textured mezcal around my mouth, the layer of citrus reveals itself as grapefruit—sweet but tart. On my third taste I discover a bit of banana. I thought I noticed the banana in the nose initially, but I was not sure if it was really there. This mezcal is a very interesting specimen as each tasting technique I use, reveals a new layer to its complexity. As of right now, I would say that this is a great mezcal for tequila drinkers to try that like an earthy profile, but have found traditional mezcals to be too much for their tastes. One of my favorite aspects in tasting a product is the finish—I love a long finish that takes you on a journey and Felino does just that. The other quality I look for is a distinctive taste profile and I have yet to taste any other agave product like this mezcal. 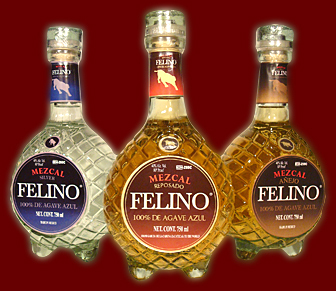 If you are looking for something mellow, earthy and new, Felino Mezcal is it.